If you look around the match reports after the win against Sunderland and the news of Hiddink’s return to Chelsea, you will find many people saying what a tough task he has at the club. I disagree with this and actually think this is going to be an easy job for him for a number of clear reasons. Chelsea were always going to recover to some degree this season with Mourinho in charge or not, and with the extra “new manager effect” too, Hiddink is going to enjoy credit for this improvement in form, whether it would have happened with Mourinho or not. Performances were undoubtedly on the rise for a number of weeks probably since the Dynamo Kiev away draw. The side finally looked back to some form of defensive balance by then. The displays at Stoke both in the Capital One Cup and the league could have yielded better results based on the performances and the side had a run of 4 clean sheets in 5 games before the loss at Leicester. 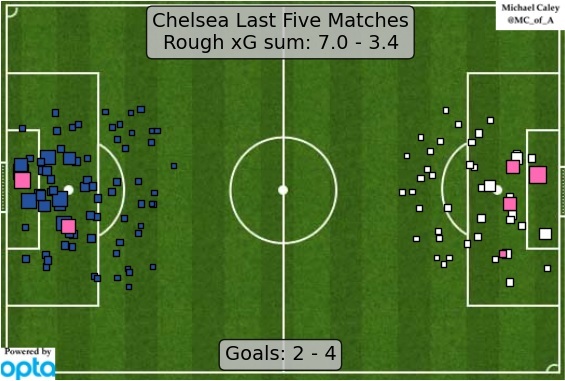 The excellent analytics expert Michael Caley showed using Expected Goals for and against that Chelsea were improving significantly in the 5 games before Mourinho was sacked. That trend continued against Sunderland but Hiddink may actually get the results that performances deserved under Mourinho, had finishing been better. Guus takes over with some winnable fixtures on the horizon. Although not technically in charge for Saturday’s home win against 19th placed Sunderland, he will invariably be judged come May on his final position vs. the position when Mourinho left – meaning he will essentially be credited with these 3 points by the press (somewhat conveniently). In the next 6 games in all competitions, Chelsea are at home for 4 of them. Of course, defeats at home have been the norm this season but this is certainly a helpful fixture list even with Watford and Everton doing well in the league right now. With what should be a straightforward FA Cup third round tie against Scunthorpe, he also gets the chance to rest a few players after the busy Christmas period and use some squad players and youngsters. This is ideal to keep the squad involved and getting some youngsters involved will make the supporters happy too. Of his first nine games in charge (excluding the FA Cup fourth round tie which has not yet been decided), the side have eight of those games in London. This is undoubtedly a huge advantage with no travelling over such a busy period. The PSG Champions League tie is after that run, meaning ideal preparation ahead of that. Very fortuitous scheduling. Anyone who has looked deeply at Chelsea’s malaise this season will note how much physical condition has played in this. The side had a very quick preseason, starting with a tour to America and having only 3 weeks of preparation for the season. Last season, the side had its entire preseason in Europe, starting on 9 July with the first league game away at Burnley on 18 August. That’s a 6 week preseason with minimal travelling. The success of the side was put ahead of commercial interests. However, it could be argued that the side (especially with so little squad depth and rotation) started to look burnt out in the second half of the season and the form of several individuals dropped and the high energy, high pressing style disappeared in favour of grinding out results. This criticism was levelled at Mourinho in his first spell at the club as the side went out in the latter stages of the Champions League as fatigue set in. This season, Mourinho looked to address this issue by planning to get progressively fitter as the season went on and to reach the second half of the season fresher than in his previous years in England. People may accuse Mourinho of thinking short-term but perhaps his biggest mistake was trying to think 6 months in advance at a club like Chelsea with a board of their impatience and short-sightedness (and lack of understanding of periodisation). José Mourinho has a very deep understanding of periodisation, together with his assistant Rui Faria, which is of stark contrast to other coaches. Secondly, they have a football-specific approach so they develop fitness as an integral part of football and football training. Mourinho doesn’t do any isolated training, it is all just a part of playing football, so these two reasons are the most important reasons why Mourinho and Chelsea are doing so well. They can play and train with the same XI almost every day and as a result the team can develop good communication and understanding, which only boosts your chances of winning trophies. Chelsea and José Mourinho are the benchmark in terms of football periodisation. That doesn’t mean they are perfect because if you look at Diego Costa he struggled with hamstring injuries almost throughout the season. So that proves that nobody is perfect but if everybody would apply the same principles as Jose Mourinho and Chelsea then the number of injuries in football would decrease dramatically. One obstacle for Hiddink could be whether he can secure Verheijen’s services at Chelsea. In 2009, although Verheijen was only a consultant and Chris Jones was promoted to work with the first team, Hiddink improved the side’s fitness massively after taking over. The side had faced an antiquated preseason under Scolari of running laps and playing 11v11 games to “open up the lungs” as he was quoted so Hiddink coming in and using Verheijen’s methodology saw the side look fitter and fresher than both Liverpool and Barcelona in highly demanding Champions League ties. The side have looked a different beast in the Champions League this season compared to league encounters. This group of players (the Hazards, Oscars and so forth) have never done a great deal in the Champions League with an early exit under Di Matteo, then the disappointing exits to Atletico Madrid and PSG under Mourinho. Hazard missed parts of both ties and it’s not an impossible theory that this bunch of players is more concerned with the Champions League than they ever were with retaining their league title. Hiddink enjoys the benefit of 9 league games before the Champions League resumes so there is no split focus or distraction. Whilst an improvement in form and morale (or form, therefore morale) is expected from Hiddink, no one at board level or amongst the supporters can seriously state that his mandate is a top four finish. Most accept that is an unlikely outcome and with the Europa League often considered a nuisance for the bigger clubs in England, Hiddink could finish 7th and not be considered to have failed. This gives him flexibility in terms of team selection, playing style and tactics and with no expectation to win every game in the pursuit of fourth, he can give the players a freedom they won’t enjoy in an ordinary season. A few poor results may see even greater chanting for Mourinho but this is not ever likely to be in the form of actually turning on Hiddink considering his history with the club, his likeability and the above-mentioned expectations placed on him. Even a Champions League exit to a side like PSG would not be wholly unexpected so Hiddink can’t really fail to deliver on his “mandate”. He can also use youngsters at times this season which the board and supporters will give him praise for. He isn’t fighting for his job like Mourinho so can afford these risks. In his last spell at the club, Hiddink was still in charge of Russia so training during international breaks was handled by Ray Wilkins – in the setup for his man management and even some public relations reasons – and the excellent (then prospect) Paul Clement, who would actually deliver the training sessions. This was the best education for Clement, who was then recommended to remain as assistant under Carlo Ancelotti and has since followed him to PSG and Real Madrid. Steve Holland is the man likely to benefit this time especially as Hiddink is now 6 years older and judging by Simon Kuper’s piece on Hiddink for ESPN, he is now likely to be even more of a delegator than before so this will be a great experience for Steve Holland and Chris Jones especially. The talk of Didier Drogba being an assistant is likely to be mostly about man management (specifically Hazard, who has seen his close friends in Demba Ba and Samuel Eto’o and Drogba himself all depart the club) and some good PR with the fanbase. A better solution would be promoting Eddie Newton permanently to assist Steve Holland, and cover for him during international weeks when he is with the England under 21 side. He also has an excellent analysis department already in place and top goalkeeper coach in Christophe Lollichon (with Hilario also involved – someone Hiddink worked with as a player in 2009). Although the press love pointing out that there isn’t quality available in January but that isn’t true. Chelsea will certainly look to add one or two extra players in key areas. Now that Mourinho has gone, it’s universally accepted that the squad desperately needs greater depth and quality across every department, yet no one was willing to admit that when Mourinho was in charge. Least of all the men who make decisions and who gave him squad players this summer who were almost all downgrades on departing squad players – an embarrassing outlook that the club could pay for for several years to come. Hiddink will get those reinforcements to increase options and most crucially, competition for complacent players like Diego Costa and Eden Hazard. Hiddink has been at Chelsea before, has worked with Roman Abramovich before and knows some of the players in Branislav Ivanovic, John Terry and John Obi Mikel. Hiddink had looked set to be appointed Chelsea manager in 2011 before the late decision to activate the clause in André Villas-Boas’ contract when Turkey refused to release Hiddink. There is no doubt that Chelsea will enjoy a strong second half to the season. They may even win the FA Cup, make a shock run to a Champions League top four finish, or go an extra round or two in the Champions League. The question is whether this justifies sacking a manager who won the league 7 months ago. Hiddink is not likely to stay beyond this season at his age. And should Manchester United appoint Mourinho, Manchester City appoint Pep Guardiola and with Jürgen Klopp at Liverpool, Chelsea will be scrambling to find a manager whilst rival clubs have arguably three of the top five in the business. This typifies the short-term thinking running through the club. The change of manager to Guus Hiddink may make things look rosy again for 5 months, but the cost could be felt for years to come. Grant, this is the best article I’ve read on Chelsea for some considerable time. It’s articulate and well-written – and it also helps that I agree with all the points you’ve made. It would be interesting to read your take on Chelsea’s over-riding focus on commercial exploitation (to the detriment of performances) and their short-termist approach to decisions. Just an idea…. ? I know it’s also not the point of the article, but there’s no real analysis or opinion on why the wheels fell off in the first place. Would be curious to see your commentary on all of the above.